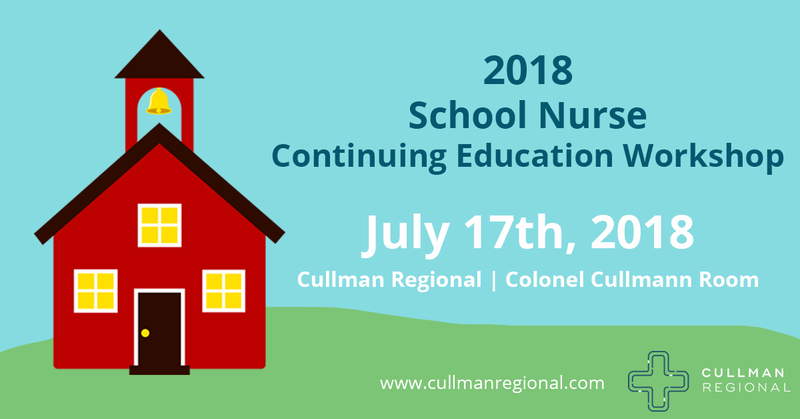 CULLMAN – Cullman Regional is hosting a School Nurse Continuing Education Workshop on July 17, giving school nurses the opportunity to earn six contact hours towards their nursing license. Topics for the workshop include diabetes management, obesity and healthy eating, child trafficking, emotional distress management and resources for adolescents. The workshop will be held on Tuesday, July 17 from 8 a.m.-3 p.m. in the Colonel Cullmann Room, located in Professional Office Building 2 on the Cullman Regional Campus (1912 Alabama Highway 157, Cullman, AL 35058). The cost of the workshop is $25 and includes breakfast and lunch. Participants must bring their nursing licenses and be present for all sessions to receive the six contact hours. Pre-registration is required. Register online at www.cullmanregional.com or call 256-735-5600. For questions regarding discussion topics, contact Kim Addison at 256-737-2025.